The Paradise Pantry Grilled Cheeeez with real California cheese. After having our dessert at the chocolate shop, we switched it up and went up Main Street for drinks. 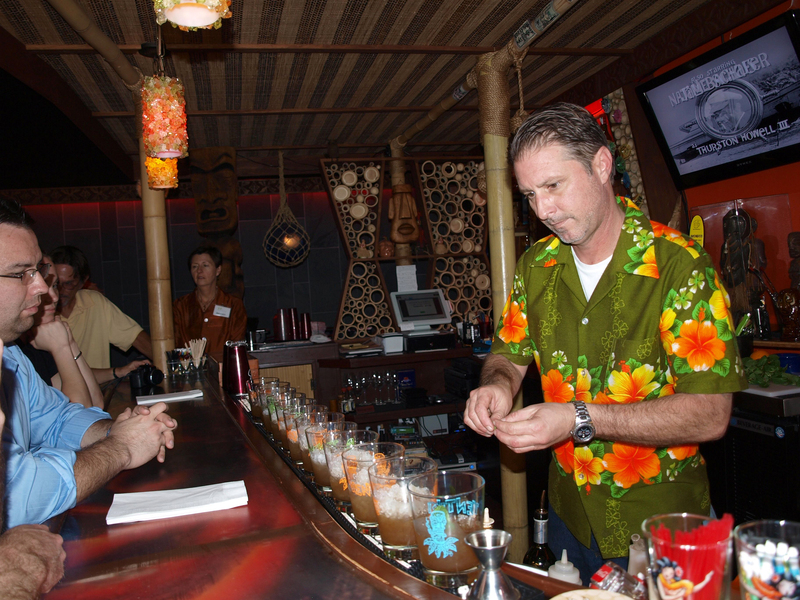 VenTiki, a kitschy retro tiki bar, proved to be a group favorite. The decor included bamboo pillars, fishing nets and Polynesian statues, plus black-and-white episodes of “Gilligan’s Island” playing on the TV. Skipper Scott Noble, one of the owners, set us up with a finger’s worth of mai tai made to Trader Vic’s original recipe, less sweet and with more of a kick than you’d find at most places these days. The Skipper Scott Noble concentrates on making classic mai tais. Noble said his bar and restaurant appeals to a more mature crowd (most of us in the group were old enough to remember the 1960s). He said younger visitors complain about the price of the drinks, but don’t realize his authentic recipes have two or three times the liquor found in the more common, modified versions of tiki classics, such as the Blue Hawaii and the Zombie. The kahlua pork slider he served was also excellent, full of flavor and not too much sauce. Then we turned and walked down Main Street again to get our main course for lunch. Cheeeez, according to the menu). 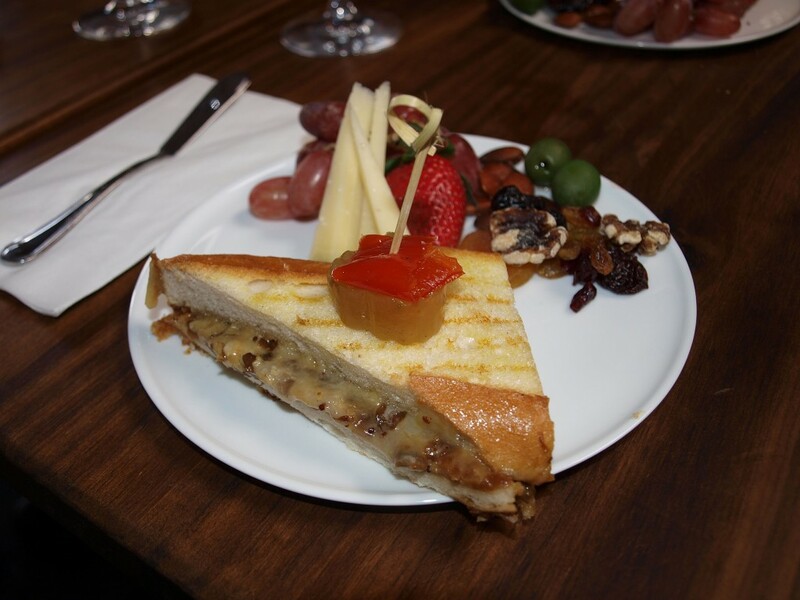 The panini contained Vella rosemary jack and aged cheddar with caramelized onions. The serving also contained an example of their cheese plates with grapes, artisan cheese, nuts, olives and dried fruit. It went wonderfully with our sample of a blended white wine from the Central Coast, Gravity Check by Ground Effect Wine Co., and equally well with a Santa Barbara red, Curtis Winery’s Heritage Cuvee. That’s all California goodness with California wine and California cheese (Vella is in Sonoma). 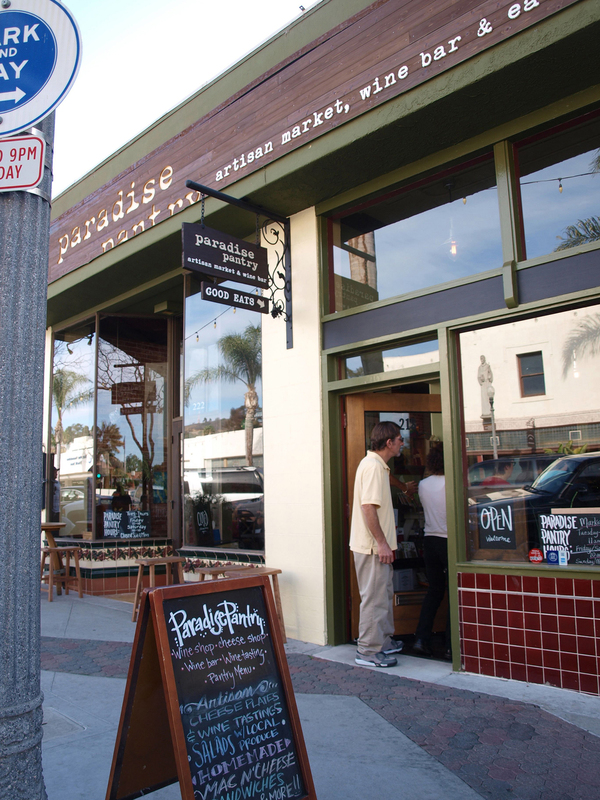 Paradise Pantry is also known for its Mac & Cheeez — three cheeses and a parmesan crust for the standard; don’t forget to ask about the weekly “killer” special. And there was still more to come without leaving Main Street. Walking through the streets of Ventura, we saw many historic buildings including the Ventura City Hall. 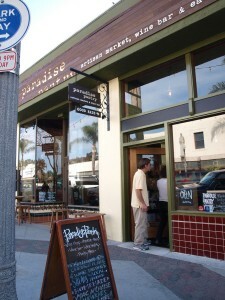 Our group of writers headed up the coast to join the Downtown Ventura Tasting Tour conducted by Ventura Food Tours. The tour proved to have just the right blend of architectural history and food sampling. One companion said he would have been bored with just a tour about buildings, but a little architectural history followed by a chance to sit and eat was just right for him. Plus we had a chance to walk off our calories. There are several blocks of walking on the tour, so if you go, wear comfortable shoes and plan for the weather. Our guide Maureen Durkin said the tours were started to share “the bounty of the county” with visitors. 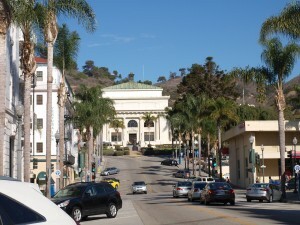 We met at Bella Maggiore Inn, designed by architect Albert C. Martin, who also built the Ventura City Hall just up the street. Durkin said the inn is reputed to be haunted by an amiable ghost named Sylvia. 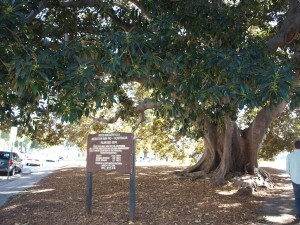 The huge Moreton Bay Fig Tree in Plaza Park was planted in 1874.
huge Moreton Bay Fig Tree that was planted in 1874. Durkin said kindness almost killed the tree. 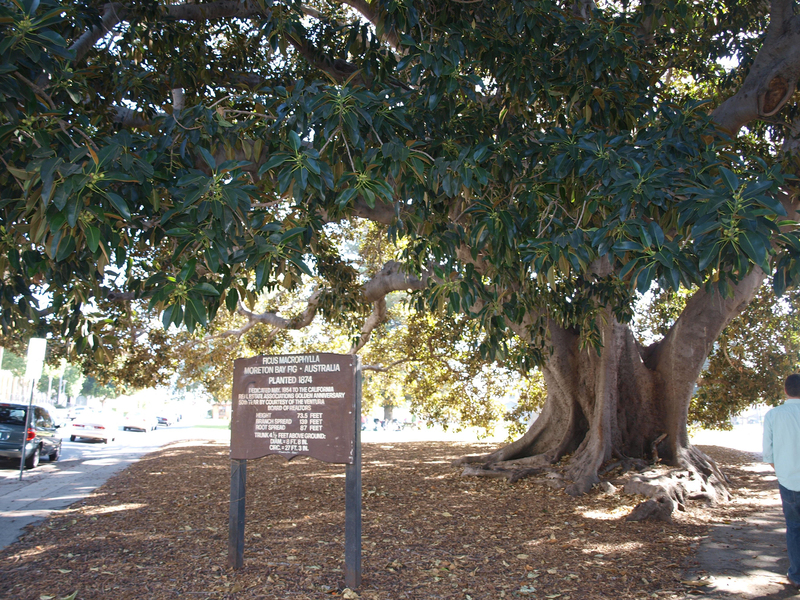 Park gardeners kept the ground beneath it clear of fallen figs and leaves, which turned out to be bad for its roots. It looked big and healthy now, as we passed beneath its spreading branches. Spencer Makenzies Fish Company is known for its giant fish tacos and amazing chowder. grilled or tempura fried fish. We had a sample of the tempura fish, and it was moist and tender inside with a light, crispy batter. 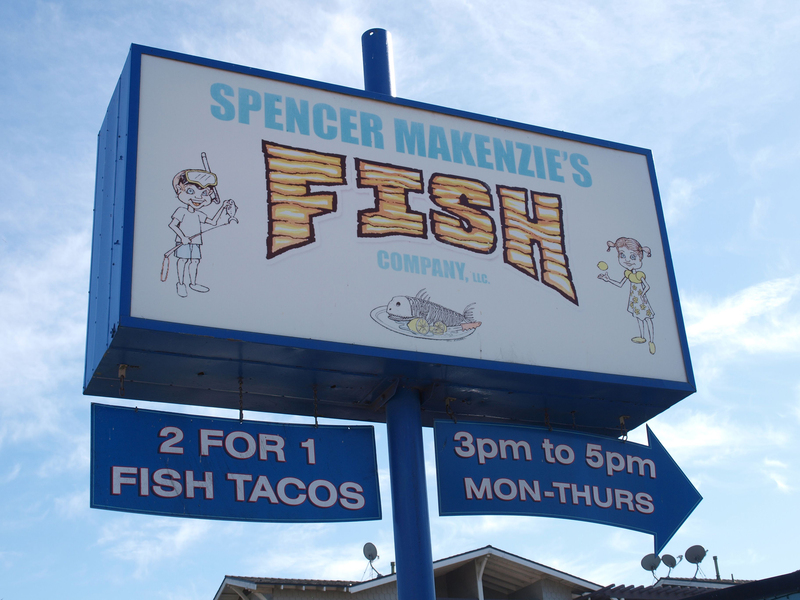 They use only sushi-grade fish in the restaurant and make their own sauces (including the signature Spencer sauce) and clam chowder. Available in cups, bowls or bread bowls, the chowder was simply the best I’ve ever tasted. The secret is a touch of white wine in the blend that cuts the typical fishy flavor. Heading to our second food stop, we passed Ema’s Herbs where the succulent lady stands guard. The amusing statue is covered with succulent plants. We learned a little about several historic buildings as we passed, but the main focus was the food. 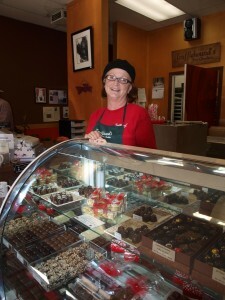 Owner Claudia Gilman displays some of the variety available at Trufflehound’s Fine Chocolates. Trufflehound’s Fine Chocolates was our second stop. Owner Claudia Gilman talked about making fine chocolates. “Chocolate is a great teacher. The No. 1 thing it teaches you is patience,” she said. She showed us truffles and molded chocolates and acetate transfer sheets used to decorate flat chocolates. She let us sample her couverture chocolate — white, milk and dark. This is the foundation chocolate she uses to make her treats. This was just the beginning of our food adventure in Ventura. 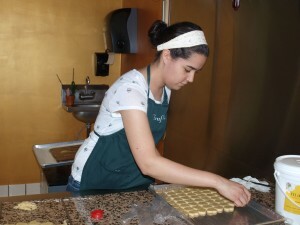 Ashley Butler cuts out marzipan hearts at Trufflehound’s Fine Chocolates. Rail Europe is offering 10% savings on the 5-days or 20% off the 10-days German Rail Passes for travel over a one-month time period. Book by April 29, 2014 for travel now through May 31, 2014 and explore Germany’s cosmopolitan cities, charming villages and beautiful countryside via the country’s extensive rail system. If you’re thinking about visiting Germany, Rail Europe makes a suggestion. Don’t just visit it: see it. Really see it by taking the train because even the most beautifully engineered German car in the world, and there are many, can’t take you to as many places, as fast, as the Deutsche Bahn (DB) can. Germany’s varied terrain and multi-faceted charms make train travel an ideal way to immerse yourself in its culture instead of just flying through it. Whether your enticement is its spectacular mountains, quaint villages, or some of the most cosmopolitan cities on earth. The train doesn’t just leave you in the center of things, but lets you go to the hinterlands while doing something even more magnificent – take your eyes off the road. So why make your travel plans with Rail Europe? Because only Rail Europe has a direct connection to the DB system, providing live availabilities and instant confirmation for all trains in Germany, as well as e-tickets. Plus Rail Europe offers tickets for international trains between Germany and France, Switzerland, Italy and more. They offer the same full range of fares as if you were in Germany, and a price guarantee to make sure you get the lowest price. So what are the differences between booking with Rail Europe and getting tickets or passes elsewhere? Let’s start with stress-free and budget-friendly travel, online exchange, guaranteed seats and booking in English, French or Spanish. In addition, Rail Europe also gives you the best tools to help you choose between train tickets, rail passes and activities using the multi-city search, Pass Finder and Activity Wizard options, as well as a comprehensive rail help section to answer any questions you may have about traveling by train – before, during and after your trip. Plus, they have a handy iPhone App and mobile site to assist those who are always on the go. And still, there’s more. Rail Europe is more than a unified booking experience for Germany. It’s a Single Stop for European Rail Travel, combining the maps, schedules and fares for over 50 different train companies across Europe, creating one stop to plan and book your trip. So start planning, booking, and traveling with Rail Europe now – your dream trip to Germany is just a click away! LEGOLAND California Resort has opened its newest attraction featuring a behind-the-scenes look at “The LEGO® Movie” with THE LEGO® MOVIE EXPERIENCE. This off-spring from the hit movie gives guests a chance to step onto a LEGO® soundstage, see actual movie footage along with interviews with the cast and explore some of the awesome LEGO models which helped inspire the new and completely original 3D animated adventure that grossed more than $200 million in its first two weeks in the worldwide box office. Actor Jadon Sand, who plays “Finn” and worked alongside Will Ferrell in “The LEGO Movie,” was the special guest at the grand opening ceremony where a giant curtain dropped to reveal THE LEGO MOVIE EXPERIENCE to Park guests for the first time. THE LEGO MOVIE EXPERIENCE features more than 1200 LEGO models made out of more than three million LEGO bricks. It took a team of ten Model Builders more than 2000 hours to assemble and a team of four Model Builders six weeks to reassemble in Carlsbad. The new attraction offers guests an up-close look at the famous worlds featured in the film such as Bricksburg, Middle Zealand, Old West, Cloud Cuckooland and Octane Tower. Movie fans can stand in the same place as Finn and his father, “Lord Business,” played by Ferrell, and imagine themselves in the scene that has become famous in just weeks. THE LEGO MOVIE EXPERIENCE offers a unique thrill that can be enjoyed by LEGO fans of all ages. “The LEGO Movie” tells an original 3D computer animated story about Emmet, an ordinary, rules-following, perfectly average LEGO minifigure who is mistakenly identified as the most extraordinary person and the key to saving the world. He is drafted into a fellowship of strangers on an epic quest to stop an evil tyrant, a journey for which Emmet is hopelessly and hilariously unprepared, and turns out to be a lot more special than he ever imagined. Show them why Huntington Beach is the place for the ultimate California beach vacation and you could win a weekend getaway! There is no shortage of activities and Surf City USA love this month! Share your photos on Instagram or Twitter tagged with #SurfCityUSA and then complete your entry by claiming one of your photos. There is no limit to the number of photos you can submit! Please see contest terms and conditions for full details. Winners will be chosen on March 6 and April 3. There is only one place to be on St. Patrick’s Day and that is Ireland. The St Patrick’s festival is the traditional starting point of the vacation season and what a year 2014 is going to be. It kicks off with the launch this spring of the Wild Atlantic Way, the longest designated driving route in the world. The Wild Atlantic Way will be Ireland’s biggest tourism story for 2014. Stretching 2,500km from County Cork on the south coast, to Donegal in the northwest, the Wild Atlantic Way is the longest coastal touring route in the world. Taking in seven counties and three provinces (Ulster, Connaught and Munster) the route is defined by its spectacular Atlantic views, a generous scattering of islands and swathes of dramatic coastal scenery including cliffs and peninsulas. The Wild Atlantic Way can be driven, walked or cycled and avoids main roads and highways, keeping the route more local and closer to the communities who live there. Seaport Village welcomes the most colorful, entertaining and eccentric street performers from around the world at its annual Spring Busker Festival on March 29,30 from noon to 6 p.m.
Now in its eighth year, the celebration brings an assortment of stilt walkers, contortionists, acrobalancers and more to the cobblestone streets of downtown’s Seaport Village at this free festival. Popular across the globe, buskers are public street performers known for their unusual and awe-inspiring acts. San Francisco’s Pier 39, Boston’s Faneuil Hall and London’s Covent Gardens are locations known to have vibrant busker scenes that showcase this incredible street art. Seaport Village’s Spring Busker Festival is the only one of its kind in California, and brings 10 to 12 acts to perform throughout the outdoor waterfront shopping, dining and entertainment district. This year, returning for another night of unforgettable acts, Seaport Village will let the street performers loose for Buskers After Dark on Saturday, March 29 from 7 p.m. to 10 p.m. The untamed show will feature a DJ, food and drink specials and multiple busker acts best suited for those over 18. Shops, restaurants and eateries will add to Seaport’s Spring Busker Festival flair with special sales. All shops, restaurants and eateries will be open for shopping and dining from 10 a.m. to 9 p.m. While the Spring Busker Festival is free of charge, all buskers will be accepting tips. We had a little bit of everything at Park City ski resort. Wind, snow, fog — but we still had a great time exploring this Utah ski resort nestled up against the city with the same name. You can actually catch a chairlift out of town, which must inspire a lot of the town folk to call in sick on a powder day. Actually, the bosses probably plan on it. Park City Mountain offers 3,300 acres of skiing. There’s also nine, count them nine, bowls with 750 acres. That’s a lot of territory to cover with the fine, dry Utah snow, but coverage was excellent when we arrived. Once again, it was ski down, jump on another empty chairlift and shoot back up to the top. Park City has a total of 16 lifts, including four high speed 6-packs and three high speed quads. Their total uphill capacity is 31,000 skiers an hour, which should be tested this President’s Day weekend with every hotel room booked solid. A light snow started and would continue off and on for the rest of the day. Not a heavy Sierra snow, but the light, dry snow that Utah is famous for. It’s flakes were just big enough to sting your face if you took off your facemask. Canyons is a huge ski resort on the edge of Park City, Utah. The resort made the top 10 ranking in “Ski Magazine’s” reader resort awards for 2014. And SnoWonder would have to agree after a great day of skiing on our first stop of our Park City adventure. We couldn’t wait for the lifts to open at 9 a.m. on a slightly overcast day. Jumping on the Red Pine Gondola, we were soon halfway up the mountain. After that, it was all down hill, as we shred the groomed runs. The highest peak is the Ninety-Nine 90 which is appropriately 9,990 feet above sea level. The slopes were also wide open this week before President’s day. Often we were the only skiers in sight. We were pretty beat by 3 p.m. on the first day of our Park City adventure. Which is fine because the lifts close at 4 p.m.
Join us tomorrow, when we explore Deer Valley ski resort.